A one-off Pininfarina bodied 1954 Jaguar XK120 SE that took specialists Classic Motor Cars (CMC) 6,725 hours to restore came to London for its first UK public outing. The rare Jaguar took centre stage at CMC's stand (C70) at the London Classic Car Show on February 15-18 at the ExCeL. The car won the Restoration of the Year 2017 award at the Octane Awards, which are considered the most prestigious in the industry, recognising the elite in the international historic motoring world, only a few months after being unveiled at the prestigious Pebble Beach Concours d’Elegance in California, USA, in August 2017, where it also won an award. Unlike any other XK120, Chassis S675360 features unique bodywork by famed Italian design house Pininfarina. It was first delivered to Automotive Hall of Fame inductee Max Hoffman, an Austrian-born, New York-based importer of luxury European automobiles into the United States, who inspired the production and refinement of several vehicles. It is believed that Hoffman inspired Pininfarina to reinterpret the shapes of the XK and then unveiled it at the 1955 Geneva Motor Show. During the pre-restoration forensic inspection it was found that Pininfarina had used the original XK body as the basis, also that a previous owner had painted the exterior in Burgundy, covered the seats with tan leather and changed various other aspects. CMC’s specialists faced many challenges. Some of the original parts were impossible to find such as bumpers and chrome work, so CMC remade them by hand from photographs. The technicians also had to scan the front and rear end of the car in order to make mock ups of the lights, which were then scanned and reproduced. Smaller missing items were also produced in-house. The rear window was missing and 3D scanning technology was used to scan the window aperture and make a new rear screen from the scan data. There were no signs of the original paint colour, but when the front screen was removed, a small section of original paint was discovered and used as a colour match by CMC’s paint specialist. The interior trim door cards were missing, along with the carpets and the original trim colour. A small sample of original leather was discovered when stripping the car down, which was colour matched and the original leather type and colour was used to recreate the original Ochre tan. The shape and pattern of the door cards were recreated by looking at similar Pininfarina designed cars from the period. CMC is known to never back down from a challenging restoration and has a reputation for having restored some of the most historic cars ever built. The restorers are the only company to have won the Restoration of the Year Award twice, having done so previously in 2011 with the restoration of the Lindner-Nocker Lightweight, a legendary Jaguar that many thought to be beyond repair. 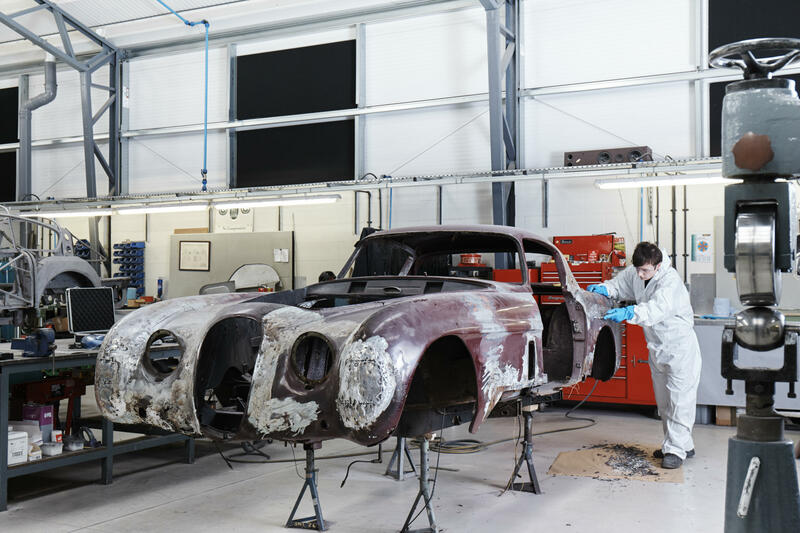 CMC’s stand at the London Classic Car Show will also feature be a mid-restoration 1958 Aston Martin DB MK III, a work-in progress that spent 35 years of its life in storage and now the specialists are bringing back to its former glory. Show visitors will also get some live action as CMC’s Director of Production Tim Griffin will be on hand providing demonstrations of the art of English Wheeling panels, an essential skill in the car restoration trade.